Comic strip characters; Encyclopedias, Juvenile. Spider-Man (Fictitious character); Miscellanea; Juvenile literature. Spider-Man (Fictitious character); History; Juvenile literature. Spider-Man (Fictitious character); Friends and associates; Juvenile literature. Amazon.com description: Product Description: Take a closer look into the web-filled world of one of the world's favorite Super Heroes, Spider-Man! 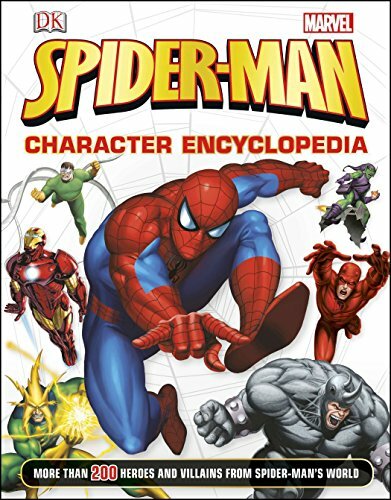 Featuring detailed profiles of more than 200 of Spidey's friends and foes, as well as tons of facts and information on the Web-Slinger himself, Spider-Man Character Encyclopedia will test your knowledge of the world of Spider-Man. Organized alphabetically, each character profile is crammed with facts, statistics, informative annotations, and exciting original comic book art illustrated by Marvel's leading artists. This ideal introduction to the Amazing Spider-Man is perfect for the newcomer or the die-hard Marvel fan, and is an excellent addition to DK's bestselling collection of Spider-Man titles. About: Take a closer look into the web-filled world of one of the world's favorite Super Heroes, Spider-Man!